In 1861 copper was discovered on Captain Hughes' station on the northern Yorke Peninsula. Further investigation proved this was so rich a find that by 1865 a population of 8,000 was living and working around the resulting mines. It was a perfect opportunity for twin brothers David and Andrew Taylor to launch a newspaper at the busy port of Wallaroo. What was more, these other two newspapers were published only once a week. The Taylor brothers' newspaper appeared twice weekly. Geographic coverage The Times was originally published at Wallaroo, but moved to Kadina in 1888. Reporting mostly covered these two towns, but to a lesser degree also Moonta. 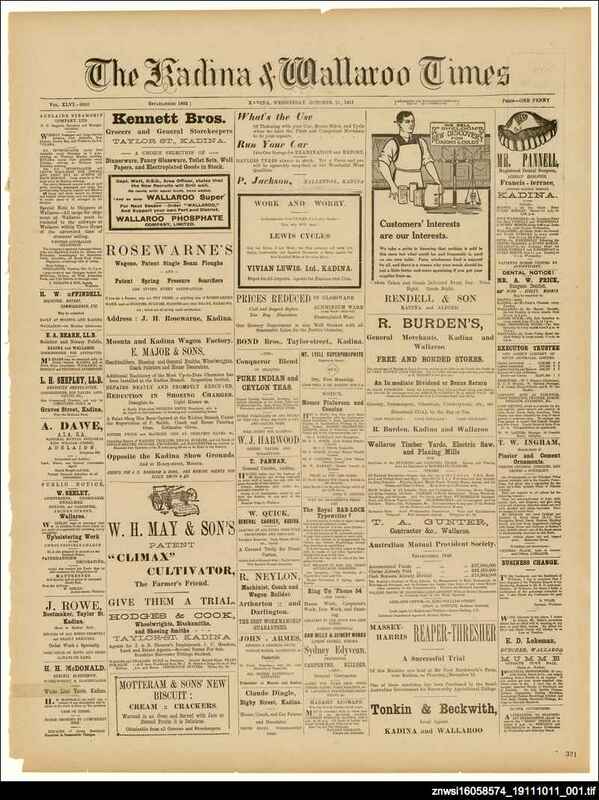 (Moonta had two newspapers of its own from 1878 - the Yorke's Penisula advertiser, and People's weekly.) Like most country newspapers in this period, the Times welcomed and printed 'country reports' from over 30 surrounding small towns and settlements. Of these, the more frequent news reports came from Bews (named after a former newspaper editor, David Bews MP), Snowtown, Paskeville, Greens Plains, Maitland and Ninnes. These were in their heyday from 1881, but this broad 'country' coverage was wound down by the mid 1890s. Politics For most of its life the Times took a conservative political approach. But initially the Taylor brothers were very outspoken, advocating their strong views for free trade, Australian independence from Britain, and expressing a generally low opinion of all politicians. In 1870 South Australian Parliament debated the newspaper's 'contempt of this House.' (18 June 1870, p. 3-4) The unpopular MP and newspaper owner, Ebenezer Ward, reputedly charged the newspaper with libel three times. (22 March 1873, p. 2) However the outspokenness of the Times in the 1860s and 1870s stopped after this and particularly from 1878 under the editorship of David Bews. Sport Cricket was obviously very popular on the Peninsula. The formation of cricket clubs in the three towns is reported in an early issue. (30 September 1865, p. 4) There was much excitement when a local committee organised WG Grace's English Eleven to come and play at Kadina during their 1874 Australian tour, for a fee of 800 pounds. The English played a combined local team captained by Julius Ey. (28 March 1874, p.2, 3) There was some annoyance when Grace cut the trip short and returned to Adelaide a day early. An interesting match was 'Smokers v Non-Smokers' in 1886, with the Smokers winning by a good margin. (7 April 1886, p. 2) Moses Champion wrote a series of articles describing the history of cricket 'in and around Kadina' published in the Times between December 1931 and January 1932. Football seems to have come later, with reports appearing from 1870. As with cricket, the large population of the three towns allowed for the formation of numerous teams, with seemingly at least two team in each town, besides junior teams. The Cornish favourite, wrestling, was well covered in the early years of the Times. An advertisement referred to a Christmas Day match played, "both in the Irish and Cornish styles." (21 December 1867, p. 1) After a lapse, wrestling was revived in 1885 with six weeks of competitions. (29 April 1885, p. 3) Matches by occasional visiting champions were fought well into the twentieth century. Horse racing was also very popular, particularly from the mid 1880s. After the First World War the popularity of horse racing increased, with reports of races from all over the state. (The Kadina trotting track was laid in the 1930s.) Pigeon matches were covered in early issues, and the 1870s also saw rifle clubs formed in the three towns. A chess club was in existence at Kadina in 1885, (3 October 1885, p. 2) with its own column in 1886. Later, draughts clubs were formed. In 1887 Mr W. Richardson opened his 'Jubilee skating rink' at Wallaroo. (26 December 1888, p. 4) In 1890 a Wallaroo baseball club was formed. (23 April 1890, p. 2) Bowls and quoits became popular around the time of the First World War. In 1958 darts was popular enough to have its own column. In 1965 a 'championship' golf course was completed at Kadina. The bicycle craze arrived locally in 1896, with a 'Cycling notes' column from 1897. The report of local celebrations for Queen Victoria's Diamond Jubilee that year noted that bicycle traffic was 'predominating'. (23 June 1897, p. 2) In the same year the Amalgamated Friendly Societies' Sports at Wallaroo included several bicycle races - as well as a billy-goat cart race. (28 July 1897, p. 3) A bicycle track had been made by the time the Wallaroo Cycling Club was formed in November. (27 November 1897, p. 2) The Kadina Cycling Club was still operating in the 1950s. The attitude of the Times to sport was sometimes mixed. In 1931 a team of local women played cricket against an Adelaide team at Wallaroo. This was during the Great Depression, and the Times wrote that, "unemployment and general trade stagnation has been off-set by little else than sport." (19 July 1930, p. 2) The editor felt that attention given to sport would be better channeled into 'work and thrift.' (18 May 1932, p. 2) Like most country newspapers, sport however, formed a major part of the Times' content up until its closure. Much vocal support was given to the Moravian missionaries on route to Coopers Creek, particularly the work of Pastor J. Kuhn with the Aboriginal people of Point Pearce. (30 June 1866, p.2, 10 October 1868, p. 3) Reference was made in 1895 to the Wesleyan Methodists of Kadina attacking the Lieutenant-Governor (Sir Samuel Way) for attending theatrical performances. (28 September 1895, p. 3) In May 1897 'BJS' wrote about the scandalous behaviour at local dances. (5 May 1897, p. 2). 'BJW' - who seems to have been the dance hall proprietor - wrote in reply, with letters going back and forth for a few weeks. In the early 1930s A. Trenberth contributed a religious column to the Times, and E. Lademan wrote a rather dry 'Thought for the week.' From 1935 the weekly thought was provided as part of Philo's column and was generally a religious comment. In the late 1930s a 'Church news' column was established, as well as an occasional 'From local pulpits' column. In 1942 'Spiritual cheer by the Rouseabout' was introduced. After the Second World War there was much less religious reporting and comment. In the years after the Second World War the newspaper printed an increasing number of articles and advertisements relating to agriculture, including reports of the wool and wheat boards, and items from the Department of Agriculture. Hanging of Elizabeth Woolcock Unfortunately the issue covering the initial arrest of Elizabeth Woolcock on charges of poisoning her husband is missing from the State Library collection. (6 September 1873) However, a summary of the final court case appears in December 1873. (6 December 1873, p. 2) A description of the execution was also published, with a transcript of Elizabeth's written confession to the Rev James Bickford, because, "rumours are so numerous and so various, and all either exaggerated or incorrect." (3 January 1874, p. 3) This was the only execution of a woman in South Australian history. Entertainments and royal and state visits Despite its distance from Adelaide, many entertainers, travelling medical men, circuses and so on, visited the district. In 1878 Raphael's Melbourne theatre troupe performed 'HMS Pinafore' at Kadina, (6 August 1881, p. 2) and in 1886 the Wallaroo Amateurs staged their own version of the operetta. (5 May 1886, p. 2) This was followed the next year by 'The Pirates of Penzance,' and it was predicted, "... apart from their excellence as a company the Pirates of Penzance should secure good attendances where there are so many Cornishmen." (19 October 1887, p. 2) Circuses such as Coles were regular visitors. (22 January 1881, p. 2) Professor Walker, the 'celebrated Canadian herbalist' visited in 1897, and spent a year in Moonta. (14 July 1897, p. 4) Although there were many local bands and music groups, including the Moonta Philharmonic Society, (29 December 1886, p. 2) these did not receive as much coverage in the Times as they did in the Plain dealer. Technological advances & local products In 1878 the Times announced that the Moonta Mining Company had imported telephones for use in the mines. (6 February 1878, p. 2) In 1883 'pillar post offices' appeared in Kadina streets. But, "this boon ... is a rather questionable one." (25 April 1883, p. 2) In 1891 the 'wonderful invention' of the phonograph was demonstrated in the Kadina Town Hall, with local tin whistle player A. Thomas, and the Quintrell family singers being recorded on wax cylinders. Possibly one of the earliest country film screenings in the state, took place in Moonta, Kadina and Wallaroo in 1898, when former actor and theatre proprietor, Wybert Reeve, brought his 'Cinematigraphe-Lumiere living pictures' to the district, promising "35 magnificent pictures every night." The short films included the Melbourne Cup, royal pageants, comic scenes, and ocean scenes. (11 May 1898, p. 3) In 1909 West's Pictures began touring country areas including the Yorke Peninsula with their silent films. A year later they set up cinemas in Kadina and Wallaroo, as did Olympia and Lyceum pictures. 'Talking' pictures arrived in 1931. (28 February 1931, p. 2) In 1959 Russack's electrical shop began selling televisions. Moonta chemist, HWW Guest, from 1884 advertised 'Guest's glycerine cough linctus'. Unlike other country chemists who developed their own medications, Guest's advertisements included testimonials from well-known South Australians including the travelling preacher Matthew Burnett (27 August 1884, p. 4), and the Rev. Dean Alexander Russell. (20 May 1885, p. 5) From the late 1880s Mrs O'Connor, a local soap and candle maker, advertised her 'Electric soap'. (19 January 1889, p. 1) In the 1890s advertisements for 'Moore's surprise soap', a product of Moore and Co. of Wallaroo, appear. (5 March 1898, p. 4) Interestingly, the testimonials of local people appear at least twice in advertisments for famous patent medicines, with 'Doan's Backache Kidney Pills' being endorsed by both Wallaroo butcher William McKee (17 April 1901, p2) and Mrs W. McLean. (14 January 1903, p. 3) From the early years of the 20th century advertisements for 'Wallaroo Super' (superphosphate) appear in the newspaper. Funeral and family notices An apparently unique feature of the Kadina and Wallaroo times was its early funeral notices. These were placed in the newspaper by local undertakers as early as 1865. (29 April 1865, p. 2) From 1927 return thanks, birth and death notices appear in the newspaper. Again, this is unusual for a country newspaper in this period. The many deaths in mining accidents are reported in detail. Interestingly, the Times used the term 'world war' as early as 1914. (9 September 1914, p. 2) The newspaper discussed the war from many angles, both during and after the conflict. Discussing the likely loss of life in 1914, the Times wrote, "But whatever we may lose in population will be made up by the fillip and incentive that trade will receive in Australia ..." (12 September 1914, p. 2) Anzac was described in a vein which has been repeated ever since, as Australia's 'baptism'. (5 May 1915, p. 2) From 1915 the effects of the War were felt more at a local level, both as copper boomed, and the numbers of local men enlisting increased. Letters from the men began to appear in 1916. During the war much of the content of the Times was related to the hostilities, and to local servicemen and women, as well as the war effort at home. Official intelligence photographs appeared in the newspaper regularly and the 'Digger doings' column described local enlistments and send-offs. By February 1942 lists of local recruits included 140 Kadina residents and 110 from Wallaroo. (25 February 1942, p. 3) Branches of the Country Women's Association, Red Cross and Schools' Patriotic Fund, worked to raise money and support the forces. Food parcels were sent regularly to the Adelaide Cheer-Up Hut. From 1943 advertisements in the Times urged individuals to buy 'Liberty Loans.' Photographs of the Battle of Britain were exhibited at Wallaroo in early 1942, at the same time that black out regulations were introduced. (24 January 1942, p. 2) Hostilities felt very close when a Kadina man, Hurtle Bald, with his wife and daughter, were killed in the bombing of Darwin. (21 February 1942, p. 2) In February 1942, due to paper shortages, the Times reluctantly went from twice weekly to weekly for the first time in its history. This was to become a permanent arrangement. Music Music was traditionally dear to the Welsh and Cornish miners, who made up a large proportion of the original population of the three towns. There were numerous bands and choirs including the award-winning Kadina Mendelssohn Choir. (23 October 1912, p. 2) This was led by Joseph Glasson senior, the local "veteran composer." (13 August 1921, p. 2) However the Times does not give as much coverage to local musicians as does its competitor, the Plain dealer. Photographs Photographs of local interest were rare throughout the life of the newspaper. The first photographs appeared in advertisements for acetylene lights, for the Adelaide firm of Fearn and Goss in 1900. (12 December 1900, p. 4) In 1912 a dark photograph was used in the advertisement for Rosewarne's Kadina Implement Factory. (22 June 1912, p. 1) A photograph of the Kadina High School was printed in a prospectus-type article for the new school in 1924. (11 June 1924, p. 4) From 1926 occasional photographs appear in the Times, depicting Adelaide events, election candidates, or as illustrations to travel articles. From 1948 to 1950 many photographs were published by long-time local photographer, Henry Pell, and from 1952 the photographs of William Atkins also appear. The centenary celebrations in 1961 attracted big crowds to the three towns, and photographs were published in the Times. In the 1930s there were several historical series published, leading up to the centenary of European settlement in South Australia in 1836. From June 1931 until his death in 1935, AG Macdonald contributed detailed stories of his adventures as a police trooper with Paul Foelsche and others in the north of Australia from the 1870s. The composer Joseph Glasson wrote about his life in five articles in August 1933. In September 1933 PD Vidal and Moses Champion wrote about the early history of Cunliffe. Champion had written about the history of local cricket from December 1931 to January 1932. Between June and August 1933 a series of articles gave detailed histories of several local business people. 'Black Grass' wrote about the early days of Kulpara in June 1937. In 1949, a column titled 'Social and personal by Annette' began, which continued until the early 1960s. Ownership The newspaper was established by brothers David and Andrew Fyfe Taylor, and George Thompson Clarkson. The Taylors had worked in newspaper firms in Edinburgh and New Zealand before arriving in Wallaroo in 1865. In 1868 Clarkson left the business. From 1878 to 1880, David Bews, whose wife was a sister to the Taylors - and whose own sister was the first wife of David Taylor - was listed as a member of the firm. From this date until his death in 1891, Bews was editor of the newspaper. In 1877 the Taylor brothers established a newspaper at Gladstone, the Areas express. Less than two months after David Bews' death, Andrew Taylor also died. From this time David Taylor ran the newspaper largely on his own. From March 1893 until January 1895 he was joined by Edward John Clark.